You want to make sure that you hire the right skip for the work you have in-hand. Make sure you choose a skip that can accommodate the volume of waste that your project generates. Regardless of whether you’re looking for skip hire Chorley or skip hire Wigan, you can bet Lostock Skip Hire have just the solution for your industrial business, so what are you waiting for? 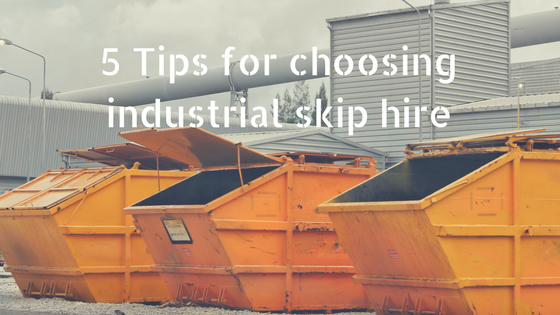 Find out how to choose the best skip for your industrial requirements today! Choose a reputable skip hire firm. Lostock Skip Hire are the experts when it comes to disposing of waste efficiently. We provide a complete range of commercial and industrial skips, starting from as small as 8-cubic yards, all the way up to 40-cubic yards. If these skips are too big for the volume of waste you expect your project to generate, you may want to consider one of the domestic skips we provide. Here at Lostock Skips, we deliver an honest service, ensuring that any advice you receive is relevant and useful. As well as this, you can expect there to be no hidden fees: the price you see is the price you pay! Find a suitable skip size. Any industry that generates immense volumes of waste can benefit from one of the industrial skips we provide at Lostock Skip Hire. When choosing skip hire Preston, you should take into consideration how big your project is and how much waste you’re expecting to produce. Estimating how much industrial waste your business will produce will allow you to choose a skip that stores your waste securely, allowing you to maintain a working environment that doesn’t compromise the safety of your employees. To find the right skip, be sure to discuss your needs in detail with our team of experts today! If you’re not entirely sure which skip you need for your skip hire Bolton, it’s always better to speak to someone with the know-how. Here at Lostock Skips, we provide a wide range of industrial skips, providing you with an ideal solution for storing and disposing of your industrial waste. When it comes to hiring a skip for your industrial business, you should always accommodate for more space than you necessarily need. By choosing a skip that’s slightly bigger, you needn’t worry about overfilling your skip. As well as this, a bigger skip will prevent the need to reorder a skip to store any excess material. Arrange for your skip to be delivered. At Lostock Skips, we specialise in skip hire Chorley, providing you with a reliable method for disposing of the waste your industry generates. With this service, you can expect skip delivery to be included in the overall cost, providing you with exceptional value for your money. Skip hire Wigan is arranged to suit you, we make sure that your skip is delivered at a time that’s convenient and the sooner your skip is delivered, the sooner you can eliminate any waste from your premises. Adhere to skip hire regulations. If you’re looking for skip hire Bolton, you need to make sure that your business follows stringent rules provided by the Local Authority. In doing so, you can keep your costs to a minimum by avoiding any fines or penalties for disposing of materials unsustainably. The same goes for skip hire Preston– choose a suitable size skip that can accommodate all of your industrial waste, ensuring that no materials are left lying on your premises. Need to know more about industrial skip hire? Call us on 01204 698153 today!